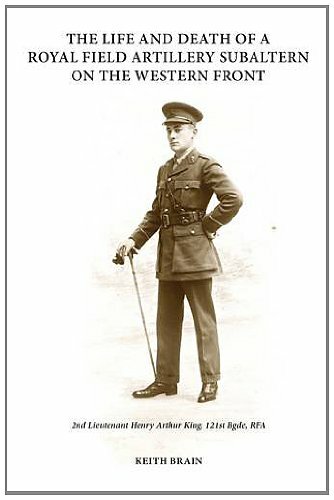 “The Life and Death of a Royal Field Artillery Subaltern on the Western Front” is a compact, 56 page-long, book recounting the life of 2nd Lt. Henry King, until his death in 1917. The detail extracted from records and letters provided by the archives at Newhaven Fort is astonishing. The book takes you on a journey through Henry’s life, from his enlistment, as a graduate fresh out of university, to his service on the Western Front in 1917. Although not particularly informative when talking about the Great War in the wider sense, it is a great little account of one man’s war, using printed photographs of Henry, documents, and images of Henry’s personal effects. One of the nicest features of this book is the, previously unpublished, image of Henry’s original grave. Little aspects like that can really make a book feel more personal. I would recommend this book to somebody who wants to gain an understanding of life on active service, in Flanders in the latter years of the war. This volume may also be attractive to somebody with a less intense interest in the Great War, as the book can be read, at a leisurely pace, in less than an hour. A family member has asked to read the book after I have finished reviewing it. This family member does not have the faintest interest in the First World War but, after a quick glance through the pages, was keen to get stuck in.